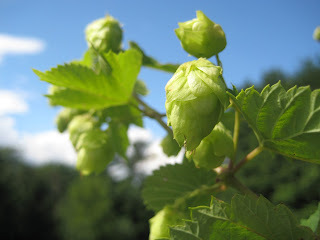 The latest hop acreage reports are out from USA Hops. There's plenty of numbers to crunch but one take away is non-Pacific Northwest (PW) hop acreage grew nearly 65% between 2015 and 2016. Non-PW hops still only account for 3.9% of hops grown in the United States, so the Pacific Northwest states of Washington, Oregon, and Idaho continue to dominate US hop production. Still, new hop farming regions outside the Pacific Northwest are emerging. For example, the state of Michigan is the largest non-Pacific Northwest hops producer at 650 acres, up over 100% from last year. My home state of California checks in a 130 acres, an increase of 53% over last year. Other notable states include Colorado at 200 acres (up 60%), Wisconsin 297 acres (up 75%) and New York at 300 acres (up 20%). US hop production increased 18.5%, so the growth of these non-PW regions are outpacing the industry considerably. It bears watching whether these new regions will continue to develop beyond a few hundred acres, which currently can only supply a small brewing niche'. Flavored malt beverages, or malternatives, are enjoying a resurgence. For someone old enough to remember the debut in the early 90's of the widely ridiculed Zima, which these malternative trace their roots back to, it is perplexing to see these products still having such strong legs in the market place. The Budweiser brand recently scored a hit with Lime-a-rita, a few years ago, following that up with various on that theme with stuff like Straw-ber-rita, Raz-ber-rita, and even Water-melon-Rita. Never mind these concoctions taste straight out of a chemistry lab. Another recent malternative success story is Not Your Father's Root Beer. Having tasting it at a beer festival last year, I'd have to agree. My father's a man of good taste and I can't imagine him drinking such a sickeningly sweet monstrosity. Each one checks in at 5.0% abv. 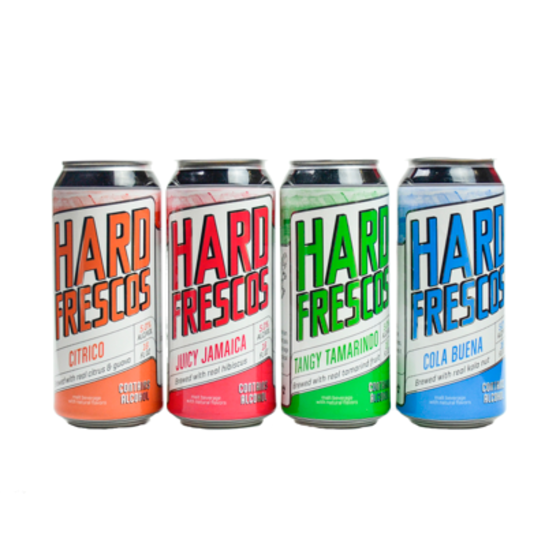 Given all the malt beverages I've tried tasted highly artificial, it seemed worth trying some samples of Hard Frescos a try. I started with the Cola Buena and unfortunately, my initial reaction was mixed. The fresh Kola seed flavors were nearly drowned out by all the sugar. My wife couldn't drink her sample without cutting it down with some sparkling water. The Hard Frescos representative who sent the samples recommended mixing Cola Buena with Bourbon, bitters and a orange twist. I think you'd have to mix this with something to cut down all that sweetness. Next up was the Tangy Tamarindo and things got better. It was indeed, nice and tangy, and while sweeter than I would have preferred, it was definitely bearable. 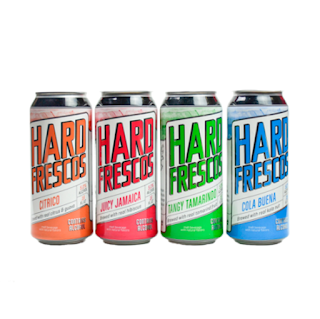 Hard Fresco's suggests mixing Tangy Tamarind with an IPA, and I could see the tangy flavors really amping up an IPA. Citrico was a subdued, complex fruity combination with a bitter finish and yes, rather sweet. As for Juicy Jamica, my wife and I slowly sipped some from our wineglasses one late evening. Can't really remember exactly how it tasted, but we were sort of lost in a nice moment to end a long day. So you have to say the flavors of Juicy Jamaica made that happen. I'd have to say Hard Frescos stand out in their field of mostly barely drinkable concoctions. They also seem partially geared as mixers for cocktails. Cocktails aren't my thing, so I can't really say too much about that, except to say all four of them contained fresh, vibrant flavors that I think would work in a mixed drink. In some cases, it was hard to get past all their sweetness. Given how artificial and soulless malternatives can be, it's encouraging to see Hard Frescos taking them in a different direction. In a recent post, I raised questions about whether different brewing regions in the United States could ever achieve their own unique terroir. I'm not talking about unique brewing styles, but a distinctive flavor born from hops and grain growing in the regional climate from the unique soil composition. Currently, 95% of all hops grown in the United States comes from jsut three states: Washington, Oregon, and Idaho. Thus, if brewing hotbeds like Northern California, San Diego, Colorado, North Carolina, Philadelphia, and New England were to ever develop their own unique terroir, hop farming would have to develop in these new areas as well. Why did hop farming become so concentrated to a small region of the country in the first place? Is it be possible to develop reliable hop supplies elsewhere in the United States? And if hops were grown extensively in other regions, would beer brewed from locally sourced hops taste any better? Or worse? To help answer these questions, I spoke with Economics Professor Thomas Marsh of Washington State University, who heads the university's IMPACT Center which studies the local agriculture in the state of Washington, and has published research on hop growing issues. Why has hop growing in United States become so concentrated in the Pacific Northwest? "When hops first started being grown in the United State, they were grown on the East Coast as well, but were susceptible to disease," explains Marsch. "Hop farming migrated to the arid regions of the Pacific Northwest which kept them protected from diseases and where the growing micro climate could be better controlled." Professor Marsh also noted there are many other industries in the Pacific Northwest which support hop farmers that don't exist in other regions. "Most of the hop post-processing facilities that convert hops into pellets or extract oils are in the Pacific Northwest". In addition, hop farming is actually very labor intensive. A local labor force experienced in growing and harvesting hops is a big asset to Pacific Northwest hop farmers. What are the barriers to growing hops in other regions of the country? Professor Marsh cited several economics barriers that would need to be overcome to create new hop growing regions. "It takes $5,000-$10,000 per acre to develop a hop farm and production costs are $6,000-$8,000 per acre. It takes about three to five years to get a hop farm up and running. Hop contracts are typically 3-5 years long as well and 90% of hop farms work under contracts." Thus, a big part of the challenge in establishing a new hop farm is meeting the obligations hop contracts which are the essential currency in the industry. "The big thing is getting a hop contract," explains Marsh. "A brewery wants a reliable supply of hops, so it's hard for them to commit a contract to a new farm. On the other hand, there has to be some certainty for the hop grower to get the required revenue to get a farm growing. So there is a bit of chicken and the egg issue. Of course, lots of breweries would like to use locally grown hops." How do you overcome these barriers? Could the hops grown in new region have desireable flavors? Or could they taste worse? 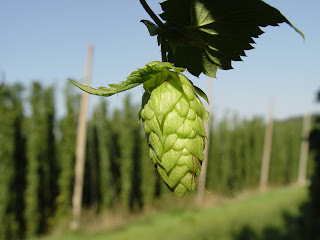 "It’s an open question how growing hops in new regions will affect the qualities of the hops. We did an experiment where we grew a hop variety under normal growing conditions in one field, and in a nearby field, we intentionally created “chafed” conditions which you might see in a drought. We brewed beer with each batch and found consumers were able to differentiate between the two and recognized the beer brewed with the hops grown in normal conditions was better than the hops grown under chafed conditions. I addition, we were able to show that consumers would be willing to pay more for beer brewed with higher quality hops"
For those eager to see hops grown in new regions, this study is both encouraging and cautionary. Suppose hops grown in Minnesota have some new, wonderful characteristic extracted from the Minnesota soils. This would make those hops desirable and consumer demand would help support a fledgling hop economy in Minnesota. But if hops grown in Minnesota just didn't taste as good as hops grown in the Pacific Northwest, beer drinkers would notice, would tend to buy other beers instead and efforts to develop hops in the region could die out. Are there any particular regions of the US where a potential for large scale hop growing could emerge? Professor Marsh has noticed small scale hop growing beginning to migrate to other parts of the United State. "If you used to Google “hop association”, all you’d find was USA Hops." (USA Hops is the leading hop growers association in the United States.) Now you’ll find hop associations in California, Michigan, and a few other places." I Googled "hop association" myself and found local hop associations in San Diego, California, the Gorst Valley of Wisconsin, the Maritimes in Canada, Michigan, Minnesota, and Ohio. In some ways, this is not surprising. Lot's of people grow hops in their backyards all over the country. But growing hops in your backyard is a lot different than creating a profitable hop growing farm. Today, some small breweries feature locally grown hops in limited quantities or special one-off releases. Will we ever get to a point where people compare and contrast flavors of Cascade hops grown in the Midwest from those in California? Will Stone Brewing ever nationally release "Cheese Head Ruination", a version of their popular Double IPA brewed exclusively with Wisconsin hops? Maybe, maybe not. But it's encouraging to think these ideas aren't as far fetched as they were just a few years ago. There aren't a lot of endurance athletes in the brewing community, but Phil Cutti, Brewmaster of Headlands Brewing is one of them. I've know Phil for nearly four years and enjoyed plenty of his beers over that time so I was glad to interview him for the latest issue of Adventure Sports Journal. You can read how has life as an outdoor endurance athlete has guided his brewery at the link below. As summer approaches, it's time once again to ramble on about a few beers which crossed my lips. I'll start with Debutante, a Biere de Garde from East Coast gypsy brewer Stillwater Artisanal. It's a collaboration brew with The Brewer's Art, a nifty Baltimore brewpub I visited very early in my blogging life. As for the beer, it's an excellent composition of toasty malt, light sweetness, spicy aromatics, fruity esters, but it's a wonderful floral honey-like character that dominates the brew. So what if the Biere de Garde style was traditionally brewed for winter, it really works well as an early summer sipper. Let's talk about another one from Stillwater, shall we? It's Surround, which Stillwater describes as an Imperial Oak Smoked Wheat Stout. And indeed, it's smokey. So smokey, the smoke just buries everything else. I sense dark chocolate flavors struggling to emerge, and a grassy earthiness on the finish. Surround also has a wonderfully creamy texture, but at 10% abv, there's also a noticeable alcohol burn. I found this a fascinating brew, reaching for the sky in the flavor department with soaring hits and misses. Doesn't quite work for me in the sum total, but wouldn't be surprised if plenty of others really dig it. Far less ambitious that Surround, but a lot more successful is Sinister Black Ale from 10 Barrel. Of course, "Sinister" might be the word you'd use to describe A-B InBev's strategy of acquiring regional breweries like 10 Barrel to better help them strong arm beer distributors to feature only A-B InBev brands. But if those diabolical plans involves beers as good at Sinister, the future of beer will be a lot better than people think. Sinister is a surprisingly deceptive brew, a simple, refreshing dark ale no where near as heavy as you would expect, with notes of light semi-sweet chocolate and molasses that work quite nicely together. Achieving such refreshing straightforwardness in a dark ale is a feat I have to applaud, no matter what evil corporation is behind it. The Session #112: Virtually no beer has local terroir...will that ever change? Let's face it, while we praise small breweries for being "local", left unspoken is that the ingredients they brew with aren't the slightest bit local. Virtually all breweries, whether small, regional, or national, source ingredients grown hundreds if not several thousands of miles away from where they are brewed. Often times, these ingredients are harvested on a completely different continent. Yes, a few breweries incorporate locally grown fruit, herbs, or spices into their brews, usually in a small limited release. While this is a great way to infuse a local terroir into beer, it still requires trucking in hops and grain over long distances to make it happen. So when Carla Jean Lauter aka The Beer Babe asks us to contemplate what roles non-brewing, beer based businesses can play in the beer world, my hope is some how, some way, hop and barley farmers can work with breweries to create regions where beer has genuine local and distinctive terroir. Is this even possible in the United States? Well, barley is pretty accommodating to being grown in different locales. It's grown in 27 states, although the overwhelming majority is grown in North Dakota, Idaho, and Montana. Barley requires similar growing conditions to wheat. It's not too much of a stretch to think barley could be grown more extensively in places like California, the Pacific Northwest, the Midwest, the Mid-Atlantic, and New England where plenty of the country's leading breweries operate. But it's the hops that give beer its the most distinctive character, and hops are a far much more temperamental beast. They grow best where the temperatures are between 40-70 degrees F, meaning wide swaths of the United States are not good places to grow them. A new hop farm may require as much as three years of development so establishing new hop farms require considerable patience and investment. This explains why over 95% of the hops grown in the United States last year came from Washington, Oregon, and Idaho. Sure, it's possible to grow hops in your backyard garden, but the larger scale production required to support an ecosystem of a small but thriving local breweries appears elusive. It's also important to consider whether the marketplace will create the necessary financial incentives. Breweries in the US brag about sourcing rare and exotic hops from places like like New Zealand or South Africa, with beer geeks typically exclaiming "Cool!" when discovering their local brewery is sourcing some far flung ingredient. Will there ever come a point where instead, they respond with "Hey buddy, how about supporting your local hop farmer?" It might happen. For example, there's been recent initiatives to support hop farming in Nebraska. If hops could take root in Nebraska, places like Kansas, Michigan, Wisconsin, Pennsylvania, and New England seem plausible. Will it happen in the foreseeable future? We can only hope.